Blog Thessalonikans protest German meddling- cataclysm to follow? Thessalonikans protest German meddling- cataclysm to follow? As I was thinking about what to blog about, I was reminded that history doesn’t repeat itself but it does rhyme. In cased you missed it amidst all the US news of Rachel Dolezal, Charleston and Marriage Equality, there has been a full run on Greek banks with over 4 Billion Euros stuffed in Greek mattresses in the last week. This ain’t no scene from “It’s a Wonderful Life” and the neighbors are not going to be pitching into the hat any more than they already have to bail out the Greek George Bailey this time. See this Saturday Night Live skit if you are not familiar with the “fool me again and we will beat you to death” ending of the classic Christmas Frank Capra morality fable. So Greek banks are closed this week as that nation is poised to default on its debt obligations and become ejected from the Eurozone. Prime Minister Tsirpas has called for a referendum as he plays his game theory scenarios out with the Eurozone nations and his own people. 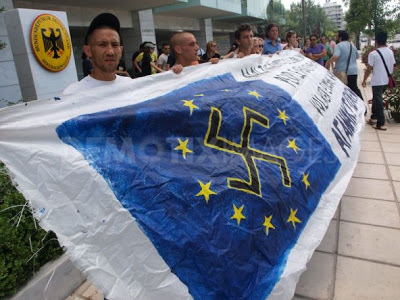 Today, there were large protests in Greece’s second largest city, Thessalonika, with some ugly, anti-German sentiment (as they are the de facto leaders in the European Central Bank and the moral leaders of the hardline EU faction). 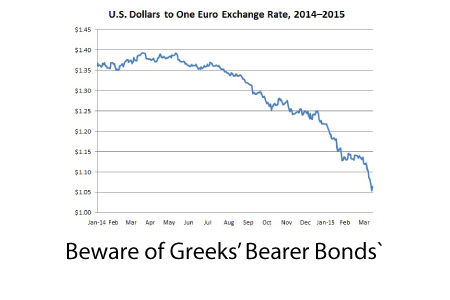 All this is why your stocks may have dropped 2-3% today and why the Euro is approaching 1:1 parity with the dollar. For better or worse, the ECB found religion (or at least that of the Japan Central Bank and the US Federal Reserve) earlier this year in preparation for this slow motion train collision and embraced a very un-Germanic doctrine of an elastic money supply (i.e. they decided they would allow themselves to print money). Did you know that in the year 390, Thessalonikans were also pretty upset at their German masters? The Wikipedia link misrepresents the events for unknown reasons but we can basically attribute the start of the Dark Ages to events in that ancient city over a gay love triangle. At that time, the Roman Army was largely a mercenary force run by ethnic Goths who did not speak the lingua franca of Latin or the local language of Greek. They were viewed as an occupation force and when the Goth general, Butheric, had the most famous Greek charioteer arrested over his involvement with Butheric’s man servant, the city reacted as if a Russian Garrison in Chicago had arrested Michael Jordan for jay walking before the 1993 NBA finals. The citizens decided to kill all the Goths. Long story short, Roman Emperor Theodosius was royally pissed and to make an example, he invited Thessalonikans to a reconciliation games where after the doors were closed, he slaughtered 7,000. Bishop Ambrose of Milan then excommunicated the Emperor and he was forced to repent by passing the Theodosian Decrees which outlawed paganism all other forms of Christianity except those espoused by Ambrose, Augustine, and Theophilus of Alexandria. In 415CE, the OVERNIGHT destruction of the Library of Alexandria, assassination of Hypatia and the most significant Jewish diaspora in history were the direct result of events that were initiated in that city of Thessalonika. To read my Houston Film Festival Award-winning screenplay about the life of Hypatia and the events that started the Dark Ages, download it here. So what is going to happen this time in Thessalonika? 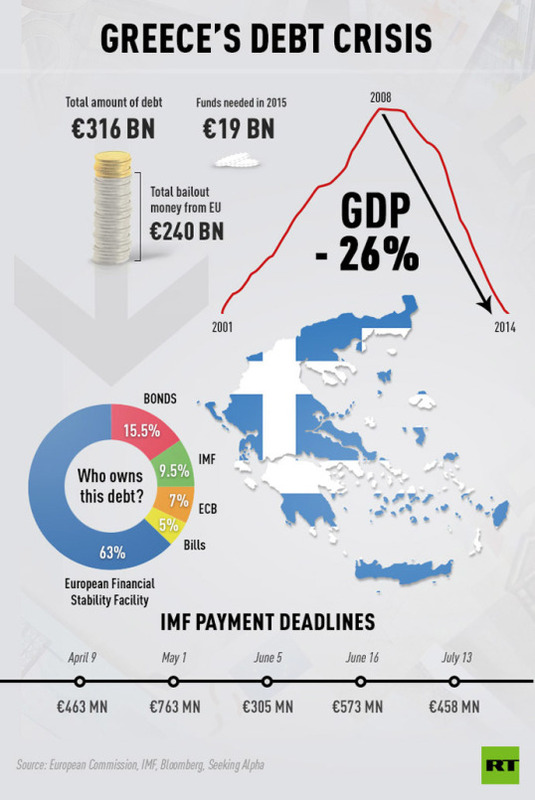 My guess is that Greece will default, exit the Eurozone, and then engineer a bail-in to create a new national currency. After that, it may continue to implode on its own because of its weak economic fundamentals and sociological troubles. But the precedent of walking away from your casino markers will have been set and other dominoes in the EU will start to learn the game that only the Citibanks and American Airlines of the world should be allowed to play – bankruptcy for fun and profit or the economic “mulligan” (a do-over shot in golf). The ultimate winner that emerges from this crisis may prove to be the World Bank-IMF who will consolidate all the failed currencies into their SDR regime backed by whatever they deem to be valuable (bitcoin, precious metals, carbon futures…it really doesn’t matter once you are in charge). Just as all the dozens of forms of Christianity and alternative faiths were made apostate overnight by events triggered by protests in Thessalonika, the catholic (which means universal) credit system (from credere or belief) may one day trace its origins to a bunch of Mad Greeks.